The paper explores the project of an ambitious modal epistemology that attempts to combine the a priori methods of Chalmers’ 2D semantics with Kripke’s modal metaphysics. I argue that such a project is not viable. The ambitious modal epistemology involves an inconsistent triad composed of (1) Modal Monism, (2) Two-Dimensionalism, and what I call (3) “Metaphysical Kripkeanism”. I present the three theses and show how only two of those can be true at a time. There is a fundamental incompatibility between Chalmers’ Modal Rationalism and Kripke’s modal metaphysics. Specifically, Chalmers’ conceivability entails possibilities that a Kripkean rejects as genuinely metaphysical. However, three positive stances in modal epistemology emerge from the combinations that the triad allows. One of those offers a promising way forward for 2D modal epistemologies. But it comes with a cost, as it requires abandoning modal monism and reshaping the scope of what a priori conceivability can give us access to. I propose that we approach the epistemology of modality by putting modal metaphysics first and, specifically, by investigating the metaphysics of essence. Following a prominent Neo-Aristotelian view, I hold that metaphysical necessity depends on the nature of things, namely their essences. I further clarify that essences are core properties having distinctive superexplanatory powers. In the case of natural kinds, which is my focus in the paper, superexplanatoriness is due to the fact that the essence of a kind is what causes all the many properties and behaviors that are typically shared by all the instances of the kind. Accordingly, we know what is necessarily true of kinds by knowing what is essential to them in the sense of actually playing such causal-explanatory roles. Modal reasoning aimed at discovering metaphysical necessity thus proceeds via essentialist deduction: we move from essentialist truths to reach necessary truths. This paper aims to build a bridge between two areas of philosophical research, the structure of kinds and metaphysical modality. 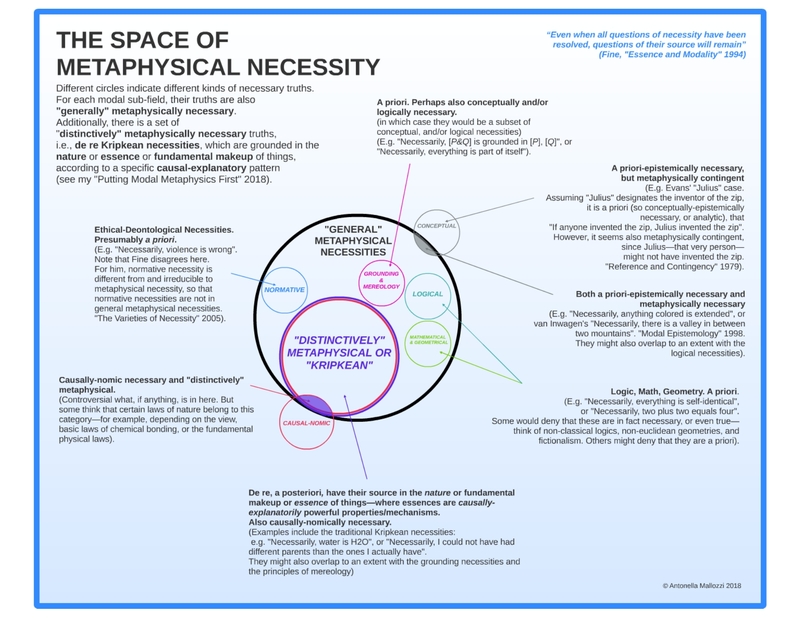 Our central thesis is that kinds typically involve super-explanatory properties, and that these properties lie behind all substantial cases of metaphysical necessity. In this paper I compare my approach to modal knowledge—a form of Essentialist Deduction, which grounds knowledge of metaphysical modality in knowledge of essence—against Williamson’s Counterfactual Theory of modal knowledge. I discuss a number of problems that have been raised against Williamson’s theory, and argue that those all ultimately trace back to a common source. Namely, the failure to elucidate the proper normative constraints on modal reasoning. This is the central problem of “Modal Epistemic Friction” for modal epistemology (Vaidya and Wallner forthcoming). On the other hand, the “Essentialist Superexplanatory” account I defend successfully addresses the problem of Modal Epistemic Friction. For it clarifies that (a) the proper constraints on metaphysical modal reasoning are essentialist constraints; and that (b) essences have distinctive causal and explanatory powers. As such, the Essentialist Superexplanatory account is an overall better choice than Counterfactual Theory in the epistemology of modality. I defend a picture of the epistemology of modality considered as a whole or of its architecture. According to this picture, the epistemology of modality is non-uniform, namely we need multiple epistemic means and methods for modal knowledge. Depending on the cases, we might need, for example, essentialist deduction, or conceivability, or counterfactual reasoning, in order to gain modal knowledge. Epistemic non-uniformity holds that there is no single canonical route for accessing modal truth. This thesis has significant advantages for recent empiricist theories of modal knowledge, in that it helps them deal with the problematic category of a priori necessities. Furthermore, epistemic non-uniformity is supported by a corresponding view of modal metaphysics. According to modal pluralism, modal space is fragmented. Logical modality, nomological modality, metaphysical modality, and so on, all individuate distinct sub-fields, based on different sources of necessity. Thereby, depending on the kind of modal truth we are looking at, different epistemic means and methods may be required to gain modal knowledge in a given sub-field. We thus learn that the epistemology of modality is non-uniform by appreciating the varieties of necessity. More generally, it seems a profitable methodology to approach the epistemology of modality by first looking at the metaphysics. As I argued elsewhere (2018a), in order to elucidate modal knowledge, we should first clarify the underlying metaphysics or the nature of modal truth.